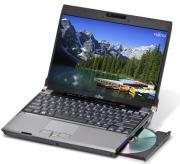 Yesterday, PC Magazine published their review of the lightweight 12″ LED-backlit laptop, the Fujitsu LifeBook P8010. When I say lightweight, I mean under three pounds in this instance, something impressive with a DVD writer internally. The P8010 replaces the Fujitsu LifeBook P7230 and represents a fairly significant upgrade over the P7230, both in battery life, and in the display (12.1 inches versus 10 inches). It’s one of the few in its class that weigh under three pounds while still including an internal optical drive (as PC Magazine points out, the Toshiba Portege R500, Sony VAIO VGN-TZ150N and Panasonic’s ToughBook W5 are pretty much it). Despise the upgrade in display and battery life, they don’t many improvements elsewhere, saying it has lagged in the fierce competition among ultraportables. This entry was posted in Fujitsu, LED Backlighting, Reviews. Bookmark the permalink. Sorry…they’re just flat wrong. The P8010 is brilliant. I really don’t know what they’re thinking calling this substandard. In fact, I’m not sure there’s another notebook better than this in its size- and weight-class.